(NR 2899 7458) Settlement site. A "rosette" pin and a "P-shaped" brooch each dating to about the 3rd century AD were found during examination of a small stone hearth and an associated shell heap which had been exposed in the sand dunes by erosion. 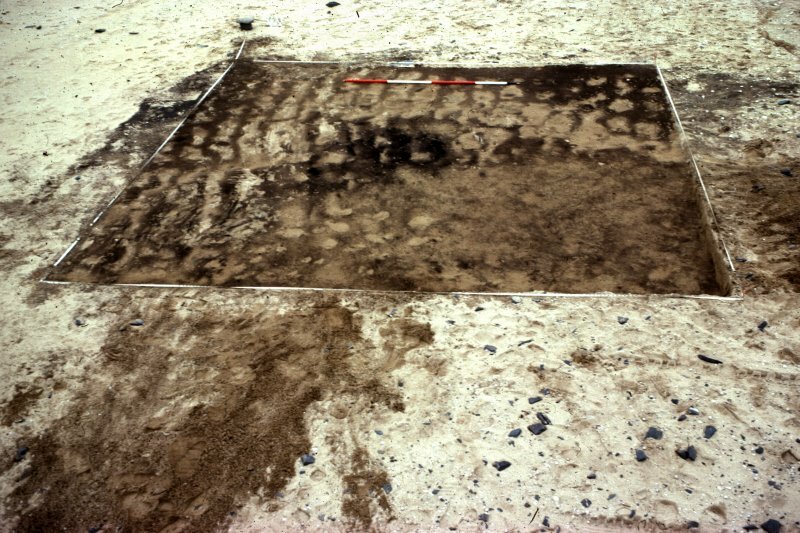 Excavated by RCAHMS in 1977. The hearth has been reconstructed, and is on display in Islay Museum. The brooch has been presented to the National Museum of Antiquities of Scotland (NMAS), and a replica will be lodged in Islay Museum. Mr Black pointed out the precise find spot of the hearth in an extensive bunker in which a number of shell middens are exposed, but no structures can be recognised. Visited by OS (N K B) 19 June 1978.
presumably been on the w side. A hearth, situated a little to the N of the centre of the interior and underlying a secondary wall, provided a radiocarbon date of 1730 bc ? 65 (GU-1439). remodelled to form a smaller dwelling measuring some 4.5m by 3m; this made use of the N wall of the original house, but an internal wall was added with a pair of large portal-stones on each side of the entrance. Immediately in front of the entrance there was a pit, which contained a complete Food Vessel. Radiocarbon dates for material from the occupation levels within the smaller house range from 1737 be ? 60 (GU-1114)tol375bc?80(GU-1274). continued in the immediate vicinity of the house. 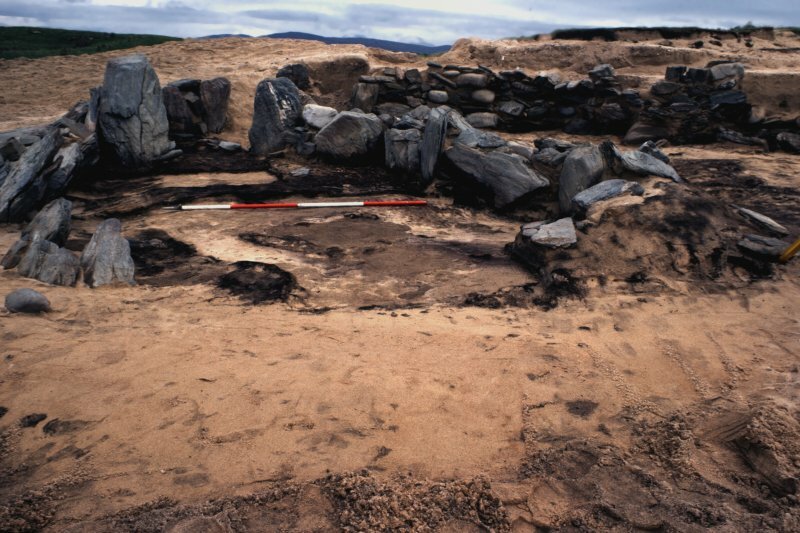 In 1977, at a point some 22m NW of the house, a hearth was uncovered; D-shaped on plan, it measured 0.85m by 0.68m within slabs that protruded up to 0.18m above the paved floor. It was associated with a bronze rosette-headed pin and a bronze brooch, belonging to distinctive types of 3rd- or 4th-century AD date. 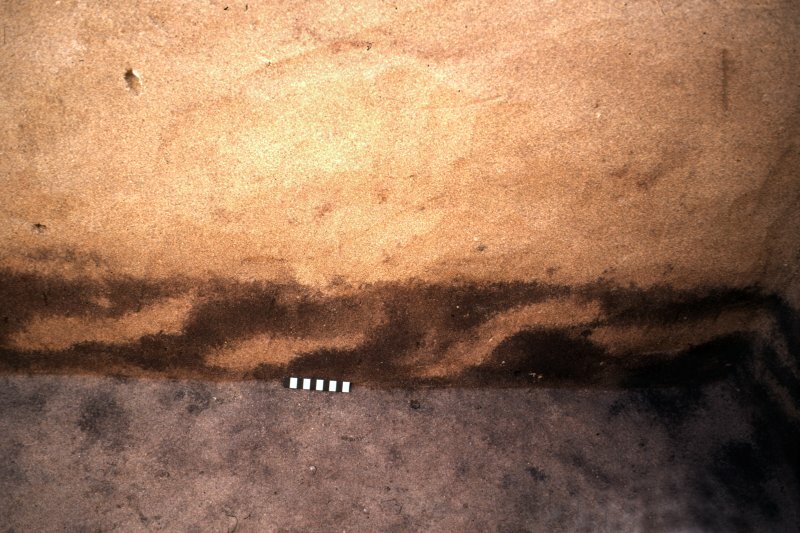 A second hearth, excavated in 1980 some 10m sw of the house, was found to have been disturbed, but two uprights and an area of paving survived, showing that it had originally measured about 1.2m by 0.7m; charcoal from it provided a radiocarbon date of ad 195 ? 60 (GU-1443) for this occupation horizon. To the W of the house the wall of a rectilinear enclosure can still be detected, the E part of which, however, has been destroyed; measuring 30m from N to S, the stones of the wall provide a slight revetment holding back the sand from the enclosed area. No signs of a cultivated land-surface were found inside and the date and purpose of the enclosure are not known. small finds are in the National Museum of Antiquities of Scotland.